I’m sure many if not most of you are familiar with SpaceALC, a great online dictionary. 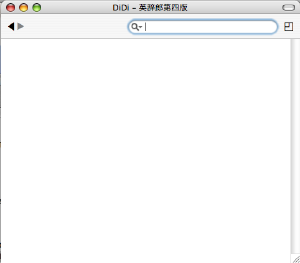 But did you know that it’s just an online version of the popular 英辞郎 (えいじろう) software? 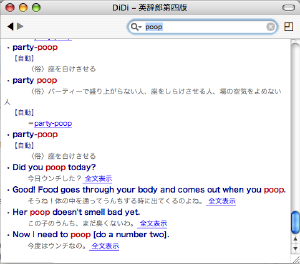 Eijirō is less of a dictionary and more of a database of different contextual examples. This can be both good and bad. No, it’s not going to provide you with a list of meanings, but example sentences can be even more valuable than a definition, especially if you are trying to write in Japanese. Plus it covers a broad range of material, much of which (slang, for example) isn’t covered in dictionaries. The fourth edition of Eijirō was released in September of this year, and as far as I know it is the first version to support Mac OS. 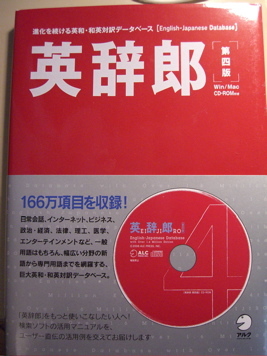 It’s only 2500 yen, and you should be able to find it at a bookstore or a computer store. After a quick installation, it loads up in a tiny little screen. The color scheme and layout will be familiar if you’ve used the online version. This is a great piece of software, and I highly recommend picking it up. It’s faster than the online version, of course, and you can access it offline. It also boasts 1,660,000 entries, which I believe is more than the online version. This entry was posted in dictionaries, Resources by Daniel. Bookmark the permalink.